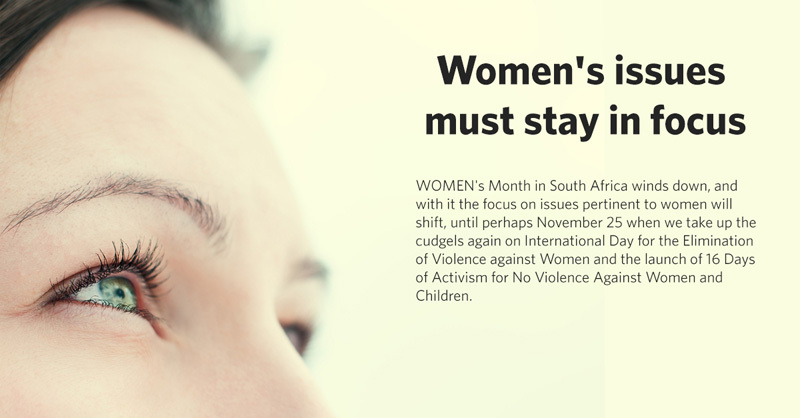 WOMEN's Month in South Africa winds down, and with it the focus on issues pertinent to women will shift, until perhaps November 25 when we take up the cudgels again on International Day for the Elimination of Violence against Women and the launch of 16 Days of Activism for No Violence Against Women and Children. During August last year there was a far greater focus on women than this year, because it marked the 60th anniversary of the 1956 Women's March to petition against the pass laws, which is recognised as a seminal moment in the women's Struggle against repressive apartheid policies. But despite a decreased level of official engagement this month, the Pretoria News did not let its meaning pass by unnoticed. We invited women from all quarters of society to contribute to the debate and, over the past 22 publishing days, carried articles under the banner "Women's Month #Don't Look Away". The contributions were as varied as the writers, who ranged from MajorGeneral Maropeng Mamotheti on the brutal crimes against women, to young activist Catherine Constantinides on the need to celebrate women. Professor Cheryl de la Rey of Tuks launched the series with thoughts on women in leadership, while Christi van der Westhuizen tackled the issue of women in the ANC. We heard from political leaders, with Speaker Baleka Mbete writing on inequality and Minister Ayanda Dlodlo on the importance of the heroines of our history; envoys from the US, UK and UAE outlined some of their interventions, and we got a message from Phumzile MlamboNgcuka at the UN on how committed leaders can bring about change when it comes to women's issues. Top businesswomen such as Dr Anna Mokgokong and Dr Judy Dlamini contributed, as did judge Annemarie de Vos. We thank these women for speaking out and, as we enter a new month, let us not look away from the issues that affect women in this country whether in the home, the office or the streets of society.